Happy Friday! Sorry for my spotty commenting/responding this week, it has been one of the busiest weeks I've had since I started here. I had planned on writing a blog post yesterday and then that didn't happen and then I thought I wouldn't even be able to post today but here I am! Ok, technically I'm cheating. I actually wrote this blog post for my work blog but I loved the cocktails I made so much that I just had to share them with you all! You all know how much I love my bubbly so if I had to choose I'd probably say the Apple Cider Mimosa is my favorite but I was really surprised at how yummy the others were as well. So without further adieu, here are the 5 fall cocktails you have to try! Apple Cider Margarita - Who says tequila is just for summer? This tasty fall cocktail is perfect for the margarita lover looking for a fall take on a summer classic. Directions: Add cinnamon and coarse sugar to a plate. Rim the edge of a glass with the cinnamon and sugar. Add a few apple slices to the bottom of the glass and top with ice. Add the Grand Mariner, gold tequila and apple cider to the glass and stir to mix. Garnish with an apple slice and a cinnamon stick. 2. 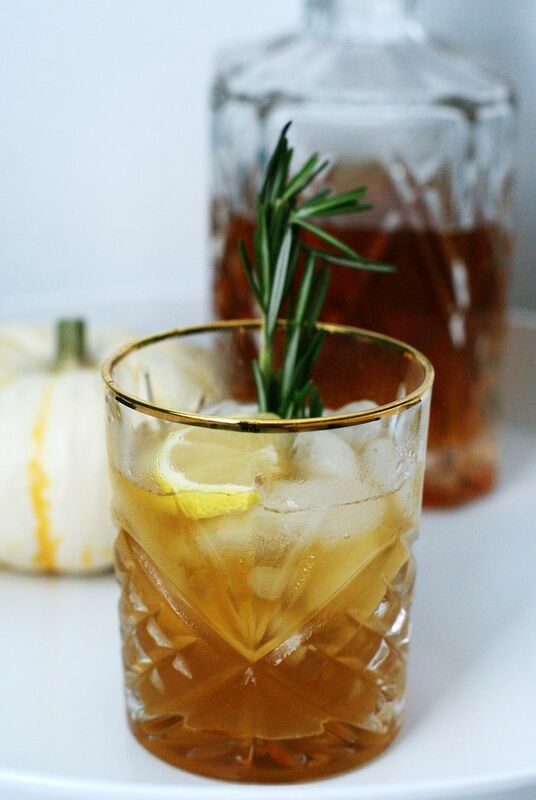 Rosemary & Maple Bourbon Sour - This twist on a classic Bourbon Sour is really perfect for any time of year but the maple syrup gives it a fall feel. Directions: Add bourbon, lemon juice, maple syrup and rosemary simple syrup to a cocktail shaker filled with ice. Strain mixture into a rocks glass filled with fresh ice. Garnish with rosemary sprig. 3. 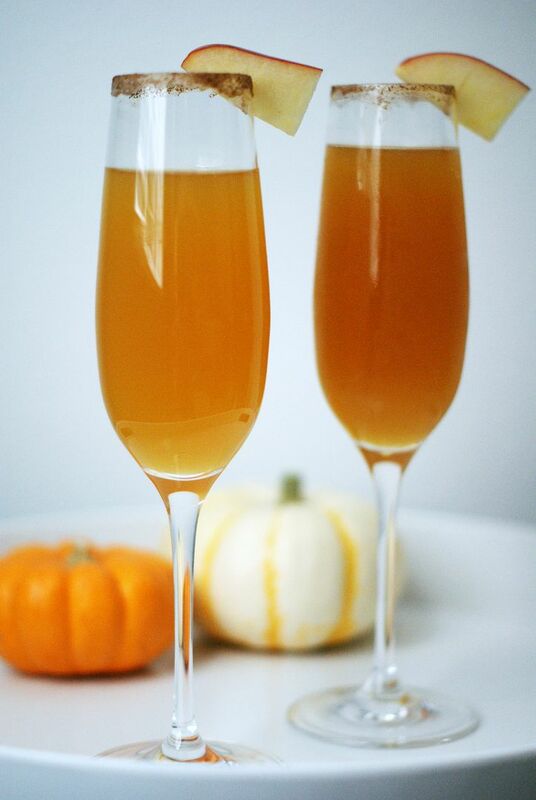 Apple Spiced Mimosas - Looking to spice up your mimosa? This is a perfect refreshing twist on everyone's favorite bubbly brunch beverage. 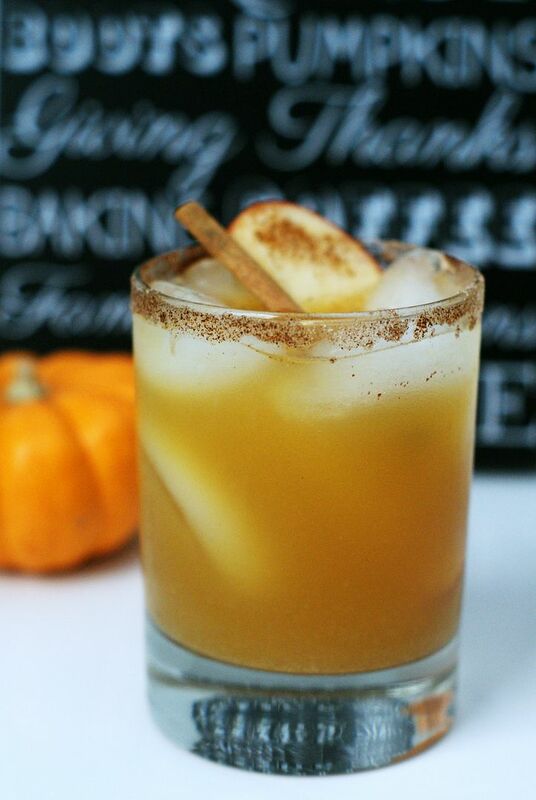 Directions: Mix apple cider, cinnamon and nutmeg together in a cocktail shaker filled with ice. Strain contents into a champagne flute. Top with champagne. Garnish with apple slice. 4. Harvest Shandy - Prefer fall beer over fall cocktails? I've got you covered! 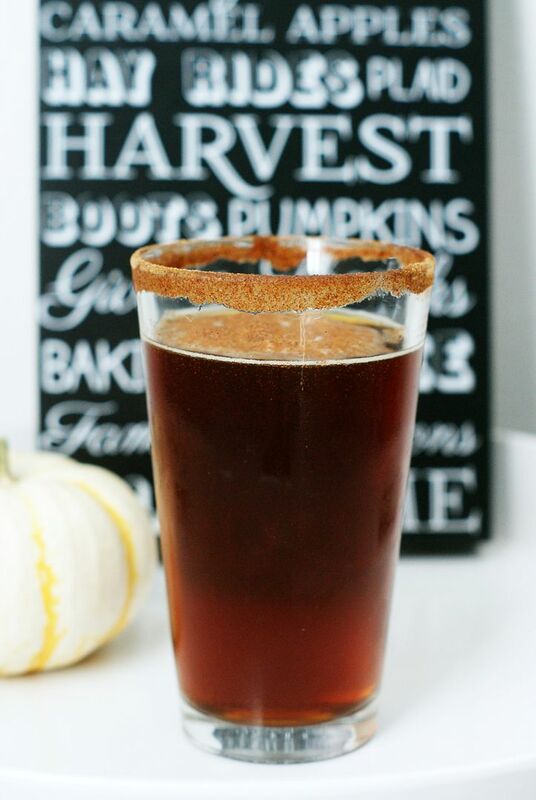 Spiced apple cider and pumpkin beer are the perfect combo for this easy and delicious shandy. Directions: Combine brown sugar, sugar, cinnamon and nutmeg on a plate. Dip the rim on a pint glass in water and then carefully rim the glass in the spice mixture. Combine apple cider and pumpkin beer in glass and stir gently. Top with a dash of cinnamon (optional). 5. Autumn Spiced Rum Punch - Rum Punches are usually synonymous with summer but add a little apple and some spices and you've got yourself a perfectly fall cocktail! Directions: In a rocks glass filled with ice, combine spiced rum and apple cider and stir gently to mix. Top with hard cider and 2-3 dashes of lemon bitters. Add a dash of nutmeg and garnish with a cinnamon stick. 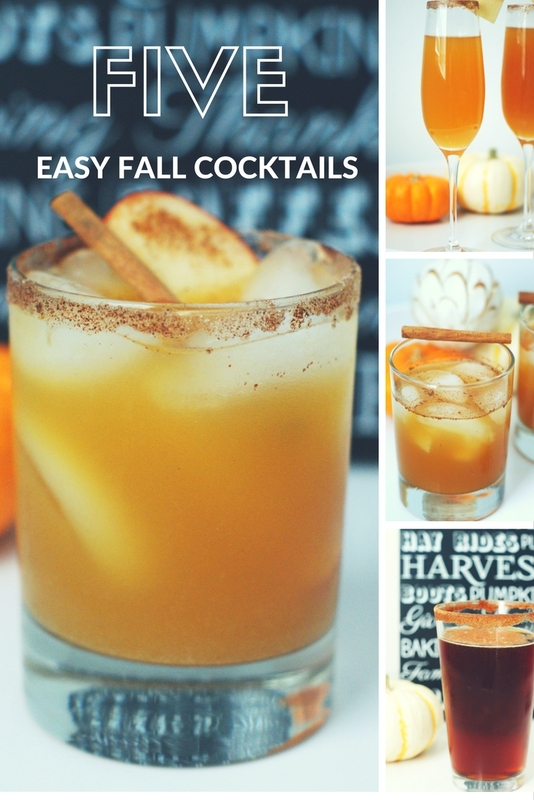 All of these look so good, but that apple cider margarita! Oh my gosh does that sound good! Have a great weekend! I want to make all of these! The bourbon drinks sounds perfect for colder weather! Girl, I am with you on this week! It has been SO busy for me too! All these drinks sound SO delicious! Apple Spiced Mimosas...yes please! ok lol to our same brain! these are way better than my half assed post though ;) seriously the shandy with the cinnamon sugar rim never gets old. and anything with bourbon and apple cider - sold! i'd like to try them all! happy friday love! Those all look delicious! I definitely need to try the shandy or the mimosa! Yum! These all sound like really fun cocktails to make, especially now with the colder weather finally showing up. Happy Friday! Oh I am always looking for good season cocktails. Thanks for sharing! Hope you get some time to rest this weekend. These all sound SO good! I love that they're all Fall inspired too! Yum! We made the apple spiced mimosas last year and they were so good! I can't wait to have some apple cider type drinks soon! I'm not much of a drinker...but the Rum Punch and the Apple Cider Margarita sound so good! I think the apple cider mimosas are finally going to happen this weekend, because I've been wanting to try since last year and we always forget! Oh these all sound so good. Thanks for sharing. Have a great weekend. We are hosting a brunch party this weekend, and I definitely want buy some cider to add to our mimosa bar. What a great idea to also add pumpkin beer to cocktails. Have a great weekend! Girl I am with you on that Apple Cider Mimosa, yum yum yum!! Hope your weekend treats you well! 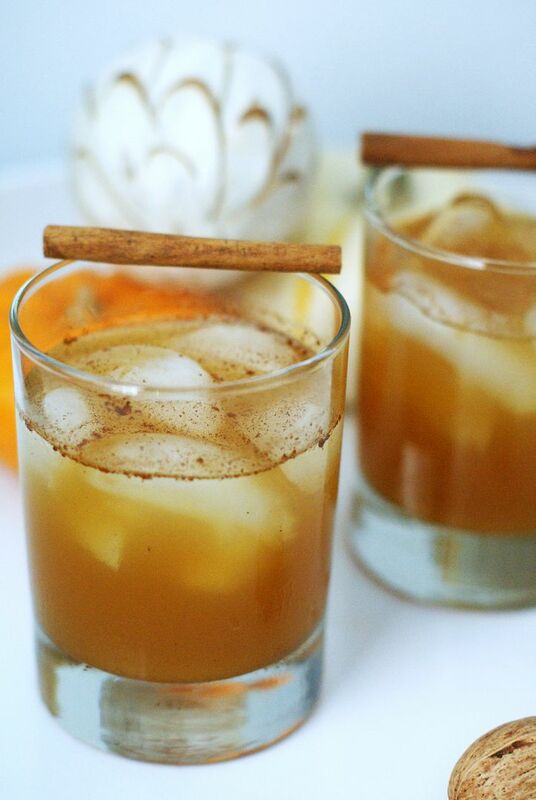 Margaritas are one of my favorite drinks, so that Apple Cider Margarita would be perfect for me for the fall! I also couldn't say no to that Apple Spiced Mimosa either! I really like the sound of the last one!! I just read them to my friend here at work too haha. Hope that your week has been good and have a fab weekend!! They all sound so delicious! Apple spiced mimosa?! Yes, please! I just had to pin this because I am going to need to try all of these. You should share more from your work blog because these all sound amazing! All of these look very good. Thank you for sharing. The apple spiced mimosa sounds delicious! Perfect for a Fall brunch...such yummy recipes for a Fall celebration. That apple cider margarita sounds right up my alley. YUM!